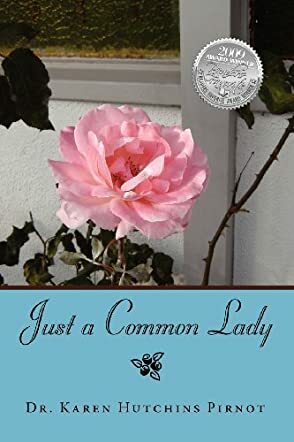 I was hooked from the moment I read the Prologue of Just a Common Lady. Karen Pirnot knows who she is and she is proud of it. She does not have to put on airs and pretend to be one of the elite. Pirnot cares more about others than herself. I would guess that she would be a great friend. Pirnot is a retired Clinical Psychologist. I suspect her childhood influenced her choice of careers. She was very young when her mother died. She and her siblings were raised scattered between relatives. Their father was never able to cope with the loss of his beloved wife. Pirnot’s life was not easy. Yet nowhere in her book does she sound self pitying. She remembers her roots. She cherishes her memories. Community and family are important to her. I enjoyed reading her story. Like her I am proud to be a common lady. We may be common ladies but we have what it takes to survive and to thrive. This book is written in an easy to read and understand style. I felt as though we were old friends and she was sharing her story with me. She actually reminds me of a dear friend, Dr. Fran Davis. Davis has that same special something that is rare in this day. Their cup is half full and constantly refilling.